In all honesty, I’m not quite sure how to kick this one off. Do you like pudding? Or cake? Maybe both? If you’re into something soft yet firm-crusted and perhaps a little gooey on the inside, then fill yourself with hope. I had this for breakfast this morning and haven’t looked back. Why did it take me so long to get to this stage of sunlit ecstasy (what does that even mean)? Embarrassingly, I have too many questions to ask myself. It’s the 3rd day of June and I feel like having a third cup of coffee. I like looking at the stains up and along the sides of the cup, a few viscous drops never really making it halfway down the porcelain breadth. Although some things in my personal schedule have shifted a little, constants remain, like almost-selfish spaces of time to myself, spent with a good book, science literature… and, yes, absolutely random ovenputtogethers baking bonanzas. I’ll be truthful and say that I still prefer the taste and texture of traditional baked cake, but semolina, or coarse, purified durum wheat, indeed lends a more interesting albeit unorthodox flavour. Let’s go through the motions. 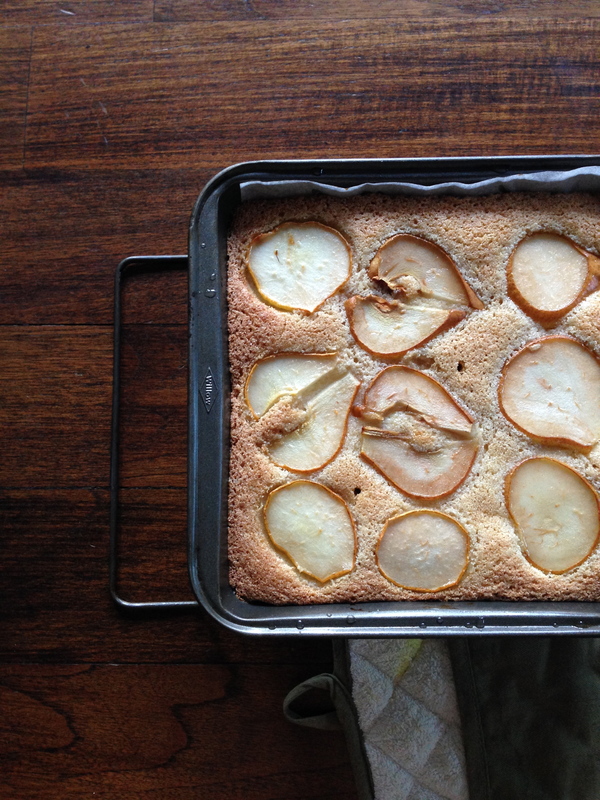 What we have here is a layer of pears on the bottom, then a semolina cake enriched with plenty of vanilla and a little elderflower cordial, then another layer of pear. Everything is brushed with what would seem like too much elderflower syrup after baking. With regard to the pears, I used the soft and sweet Comice, but any sort will work perfectly here, be it the firmer variations like Bosc or Concorde, or even Green or Red Anjou. Whatever’s lurking in the closet. 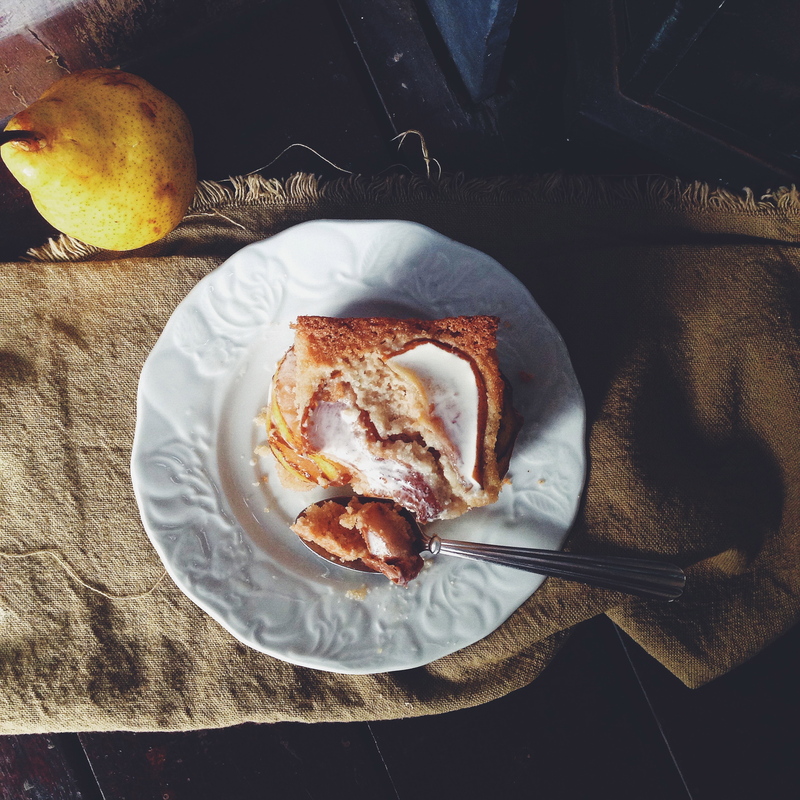 I was initially afraid of using the sort which is perfect eaten raw, for fear of everything disintegrating into fruity mush, but the recipe yielded a surprisingly pleasing result; the moisture of the soft pear paired wonderfully with the drier cake (pre-drizzle of course). – Please do yourself a favour and have this drenched in heavy cream! 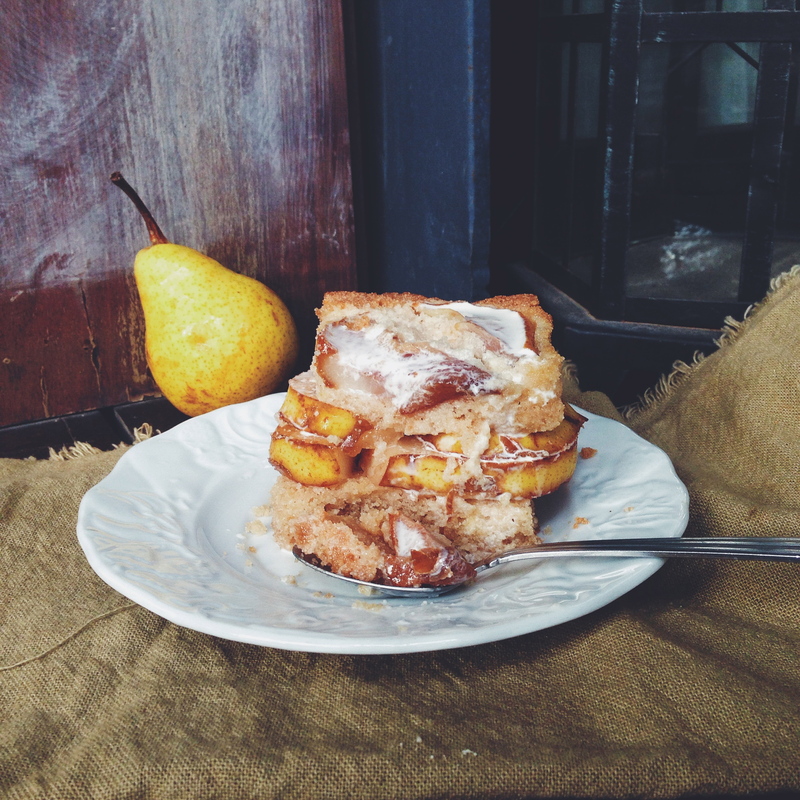 – Whilst drizzling the syrup, you will notice that you will only be able to do so on the parts of the cake not covered by the pear (obviously). That’s alright, because the moisture from the pear seeps into the surface it covers, so everything is nicely balanced. 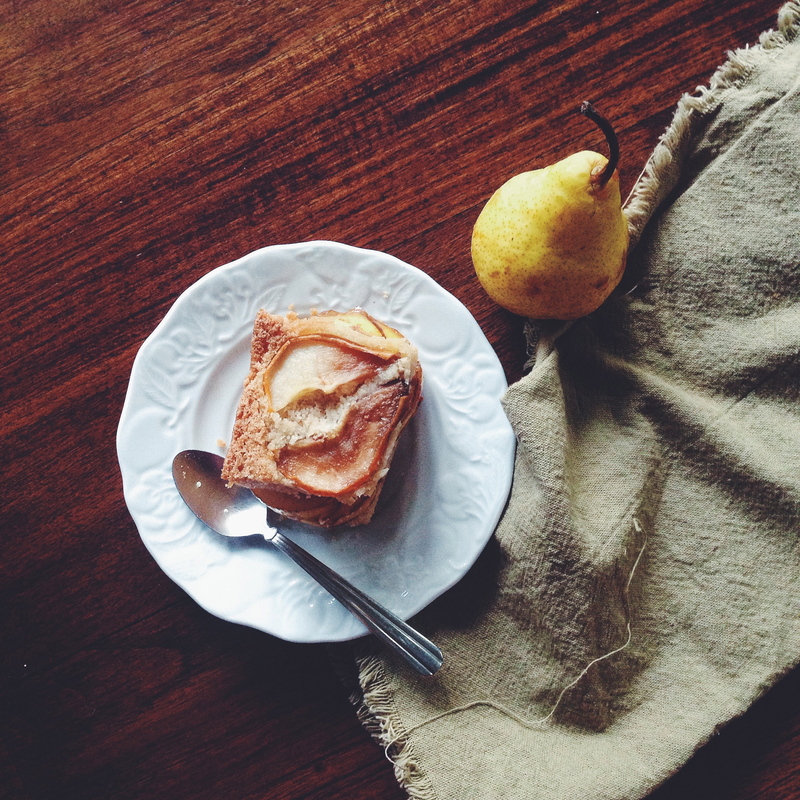 I’m not quite sure what exactly compelled me to pair semolina with pear, but I’m glad keen instinct drove me to do so. For the elderflower syrup: 1/2 cup elderflower cordial mixed with 1/2 cup filtered water, mixed and warmed in the microwave for a while. Preheat your oven to 177C (350F), and grease and line an 8×8 or 9×9-inch baking pan. In a medium bowl, whisk together the dry ingredients (semolina, salt and leavening agents) and set aside. With an electrical beater, or using a whisk and good old bicep strength, cream together the butter, sugar and vanilla extract, until pale and very fluffy. Beat in the eggs, then the milk. Pour in the dry mix you set aside and fold in using a spatula until everything is just combined. The mix will look pale, coarse and rather thick. 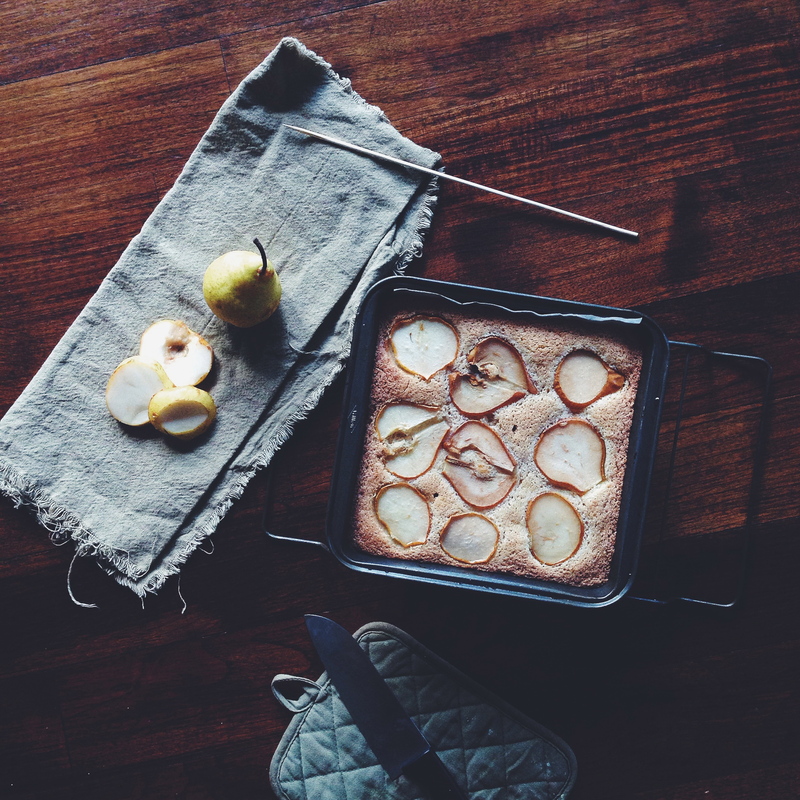 Core and cut your pears into slices around a 1/2-inch thick, and place a layer of slices on the bottom of the pan. Scrape the cake batter into the pan and use the spatula to make the top smooth, spreading the batter into the corners. Layer more slices on top, but make sure there’s some space between the slices for the syrup later on. Bake in the preheated oven for 25-28 minutes, or when a wooden skewer inserted comes out clean. This took me around 26 minutes. While the cake is baking, mix together the syrup ingredients. Remove the cake from the oven and drizzle on all of the syrup. Yes, all of it! This is what will ensure the pudding-like result. To serve, scoop some of the cake onto a plate and cut in half horizontally. 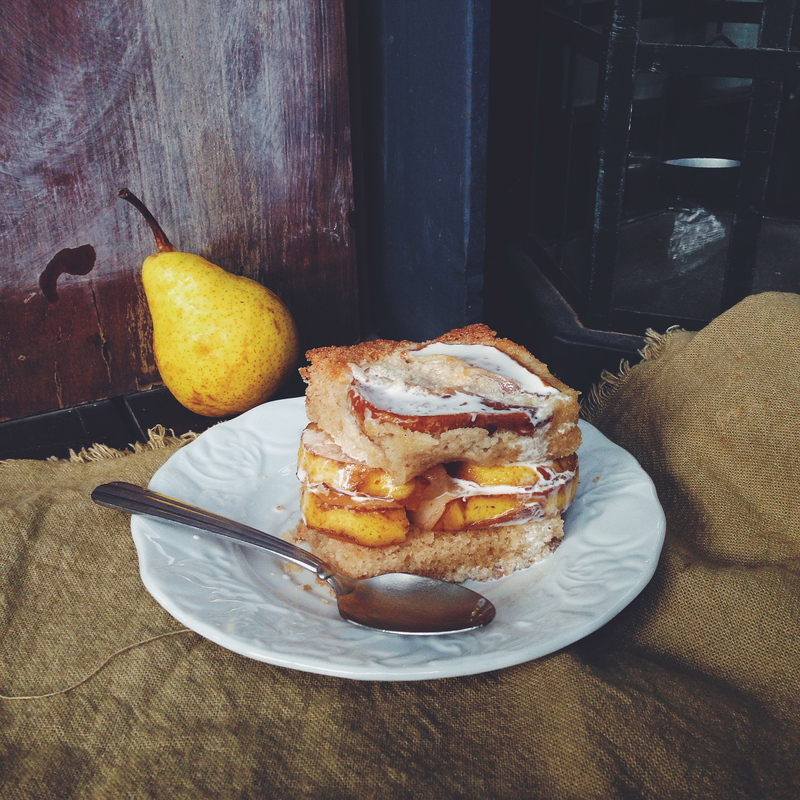 Sandwich 2 or 3 slices of pear in between the slices, then drench everything in heavy whipping cream. Enjoy whenever. Hello alex! I’m just starting to get into baking. Just wondering, do you come up with all these recipes on your own? How do you know how much of everything to add? Hi there! Some of the recipes are originals, typically the simpler ones with less complex techniques, because I myself am no professional baker and simply like to have fun experimenting with different flavours and ingredients in the kitchen. The ‘original’ component would be the flavour combinations or unusual put-togethers, however the actual techniques and proportions of ingredients are taken or modified from recipes I find in books or online. I always give credit to the original recipe if I do use it in one of my recipes(: It’s wonderful that you’re getting into this fine and delish art, so have fun and good luck!